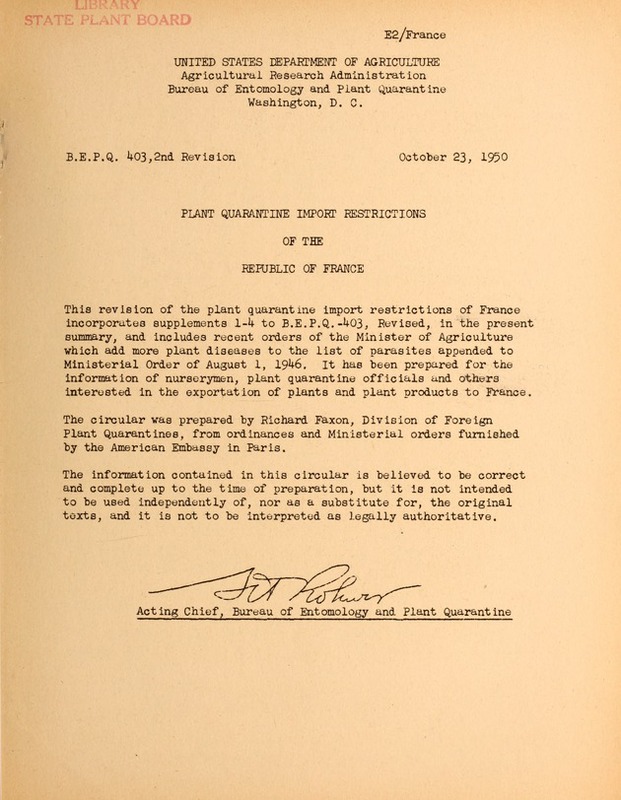 ted in the exportation of plants and plant products to France. ind it is not to be interpreted as legally authoritative. Government con8ring the protection of plants. Order of August 1, 1946 by the Minister of Agriculture. phylloxera (Phylloxera vitifoliae Fitch), Decree of May 15, 1882. Dodder (Cuscuta spp.) seeds, and forage seeds containing dodder. Decree of February 21, 1908 and Order of March 10, 1908. Plants of the genera Abies, Picea, Pinus, Pseudotsuga, and Tsuga. Comst). Decree of Mrch 8, 1932 and Order of November 19,' 1948.
as well as the bark waste of such wood. Order of Yarch 18, 1948. Universal Postal Untbn.. My 23, 1547. Florida red scale (Chysomphalus aonidum L. ). .
stock and free from virus diseases. Order of December 29, 1949. France. Order of June 18, 1948. 1932, from Supplement No. 51 quoted above. in the Ministerial Order of August 1, 1946). .Chapter I, Ariticles 2-6, Plant-defense groups established. Chapter I, Articles 7-14, Defense measures described. (adult, eggs, larvae, nymphs, seeds, germs, etc.). regulat ions. Import prohlbitions may be decl~ed. Chapter III, Articles 15-18, deals with inspection of nurseries. Chapter IV, Articles 19-22, relatesto import and export control. ste6 products are refused entry or destroyed. fense .easuros against animal and vegetal parasites of plants. ch an entry can be effected. a country of origin to the point of entry into France." Mnt Protection and designate the respbnsible agencies. A. Parasites who i must be destroyed at all t1m6s, in all places. Rhabdocline pseudotsuga Syd., needle cast. Heterodera rostochiensis Woll., golden nematode of potatoes. Order of August 1, 1949. A tsbotl. Is f emorata Olyv., fl t!&edapple" tree brer . as amended Deceiiber 1, 1949 . Green coffee i.n -a. forms. tection Service will take all measures that he may deem necessary. determine the presence of insects and plant diseases. Ajacio, Ajacoio Campo di Loro. Bayonne, Bellegarde, Bordeaux, Bordeaux-Merignac, Boulogne, Brest. Caen, Caen-Carpiquet, danfrano, Corbere, Cherbourg. Thionville, Toulouse, Toulouse-Blagnac, Tourcoing (station). corniculatus L a timothy (Phieum pretense L.
duction of white peach scale (Pseudaulacaspis pentagona Targ.). Pseudotsuga,' and Tauga from all countries on accoun of the danger of. introducing needle cast disease (Rhabdocline .pseudotsugae Syd...). Jose acale. Shipments' of lily bulbs from Japan are also included. and. use4 ,Tprtransporting the above items. of thb 'country of origin guaranteeing that the fruits are not. carriers of San Jose scale. turn abroad in the contrary case. 2. Lily bulbs from Japan. Article 5. Transit through French territory. 1. Imports must be through customs stations as above. Article 6. Refers to countries free from San Jose scale. Article 7. All previous regulations governing the entry into and. Order will be effective 90 days after its publication in the Official. Journal. The effective date is therefore March 4, 1949.
selected stock andare freo from virus diseases. Postal Union, 19423, l197, the :importation inito -F nce iS p rhibited. (1) Mixed grass seeds for forage purposes;. Holcus lanatus L., velvet grass 40 60.
tested in advance in France. -for which they can get the -parent stock for reproduction in France.